The main goal of the assignment is to retrieve information from the Delicious web site based on the user's input. We are learning how to call a REST like web service. In this case, it is the web service provided by Delicious. In addition, we will learn about Bootstrap. Bootstrap allows you to create projects with CSS that looks good on a PC, a tablet or a phone. 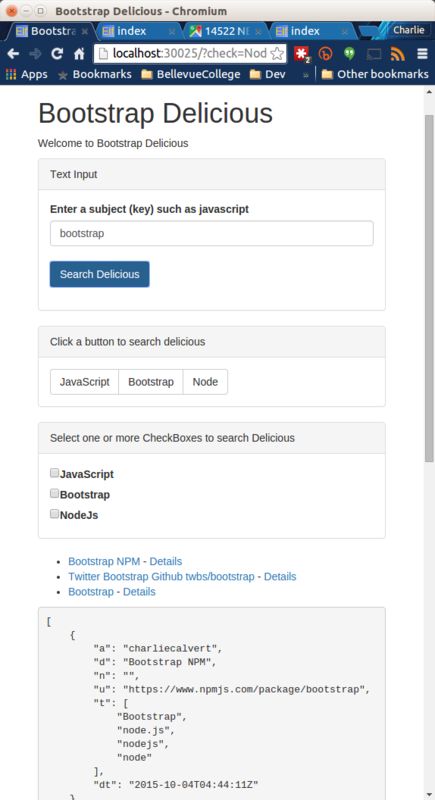 To get started using bootstrap, navigate to your repository and create a new express project called Week03-BootstrapDelicious. We will, however, have to use the script tag to link control.js into our app from layout.jade. Pass the user's request to a method that can query the Delicious web site. Append the user's request to our default query URL. For what follows, refer to your Week03-BootstrapBasics for help setting up radio buttons and check boxes. When the user selects one of them, write code in control.js to ensure they see the delicious options for links to those items. This shows the intersection between two or more tags. The last option returns an empty set. Provide three checkboxes with the same labels. The trickiest parts are the jQuery css selectors in document ready. Recall that we already covered this subject in Bootstrap Basics. The displayCheckBoxSelection must build up a query reflecting the options selected by the user. You might want to declare some local variables with names like tag, query and options to help us with this task. If the $.ajax call that uses this URL succeeds, then we iterate over the data array returned from Delicious. For each item in the array, we call appendUrl, which is designed to create a list item (LI) that contains one (or optionally two) hyperlinks. The first hyperlink opens a tab showing the Delicious link. You do not have to create the second hyperlink. In fact, I would do it only if you want a little extra credit. Don't, however, make your pursuit of the second hyperlink spoil your chances of just completing the assignment correctly. Ceate our own delicious account and query them. Provide radiobuttons for switching between your account and my account. Be sure your work is in your repository in a folder called Week03-BootstrapDelicious. Include the URL of your repository when you submit the assignment. You might also make a note of the folder in which your project resides. This might help you remember to put it in exactly the right folder. To get you started, I'll show you a halfway step that displays just a single url in the viewer. But remember, I want you to show not in the viewer, but in an unordered list. We've done that before. This selects the u (url) property of the first element in the data array. Your watch express data.u should now be set to the URL of the first object in the array returned from the server. Take the time to explore the other features of the debugger such as the locals where you can open up the data array and explore its contents.